Although there was a team competing as Wallingford and participating in the very first season of the North Berks Football League which came in to existence in 1909-10, Wallingford Town Football Club was not formed until 1922. That early incarnation of today’s club enjoyed some early success as the inaugural winners of the North Berks War Memorial Cup in 1919-20, beating Wantage Town before repeating the feat again in 1921-22 and 1922-23 and as early as 1911-12 had been runners-up in the North Berks Charity Shield, losing 1-0 against Abingdon Town. In the late 1920s the club again enjoyed some cup success, this time winning the North Berks Charity Shield by overcoming Long Wittenham Athletic in the 1929 final before losing the final tie of the following year to Stanford in the Vale. Having finished as North Berks Division 1 runners-up in 1923-24, the club switched to the Reading & District League and were crowned Premier Division winners in 1935-36. After the war, the club reverted back to North Berks competitions and enjoyed a strong period towards the end of that decade as Minor League Champions for 3 years in succession in 1948, 1949 and 1950 whilst reaching the final of the War Memorial Cup losing 1-0 to Appleton in 1945-46 and Abingdon Sea Cadets in 1947-48 before tasting victory in the final of 1949-50 having again been runners-up in the 1946-47 Charity Shield. After another spell back in the Reading League, the club became founder members of the Hellenic League in 1953 and remained a permanent fixture in the Premier Division until relegation to Division 1 in 1988-89. In the 1968-69 season the club became Hellenic League Premier Division champions for the one and only time, captained by Alan Brannan who went on to serve the club for a further 30 years as manager, chairman and club president. During the Hellenic League era the club were League Cup runners-up in 1982-83 while the second string clinched the Hellenic Reserve League title in 1984-85. By now the geographical boundaries of the Hellenic league stretched from West London to Hereford and from Hungerford to Banbury. During this time the club was regularly competing against top non-league clubs that went on the make their mark in non-league football and indeed in the Football League itself like Forest Green Rovers and Wycombe Wanderers and in 1982 in a Berks & Bucks Senior Cup tie Wallingford led Wycombe through a Charlie Allum goal before the non-league giants ran out comfortable winners just a few short years before reaching the football league and with it full time professionalism. During the 1980s the club produce some strong under 18 sides with the crop of 1982 winning the Berks and Bucks FA county cup and the 1984 youths being narrowly defeated by Abingdon United in the final of the same competition. Many of the youngsters made it into the first team and for a time during the early-mid 1980s the club looked to be on the up, regularly finishing in the top half of the Hellenic Premier division. In 1988 Wallingford ventured further than ever before for a competitive game, travelling by charter flight to Guernsey to play the Channel Island champions Vale Recreation in an FA Vase preliminary round tie, before bowing out to a 7-4 defeat. By now the side had begun to break up with many of the promising crop of players moving on to a higher grade of football with clubs like Oxford City, Banbury United, Witney and Abingdon United, having gained valuable Hellenic experience with Wallingford. For several seasons the team flirted with relegation before finally losing premier division status at the end of the 1988-89 season. A short spell in division 1 of the Hellenic League was followed by a switch to the Chiltonian League, a grade lower but more suited to the club’s capabilities at the time. 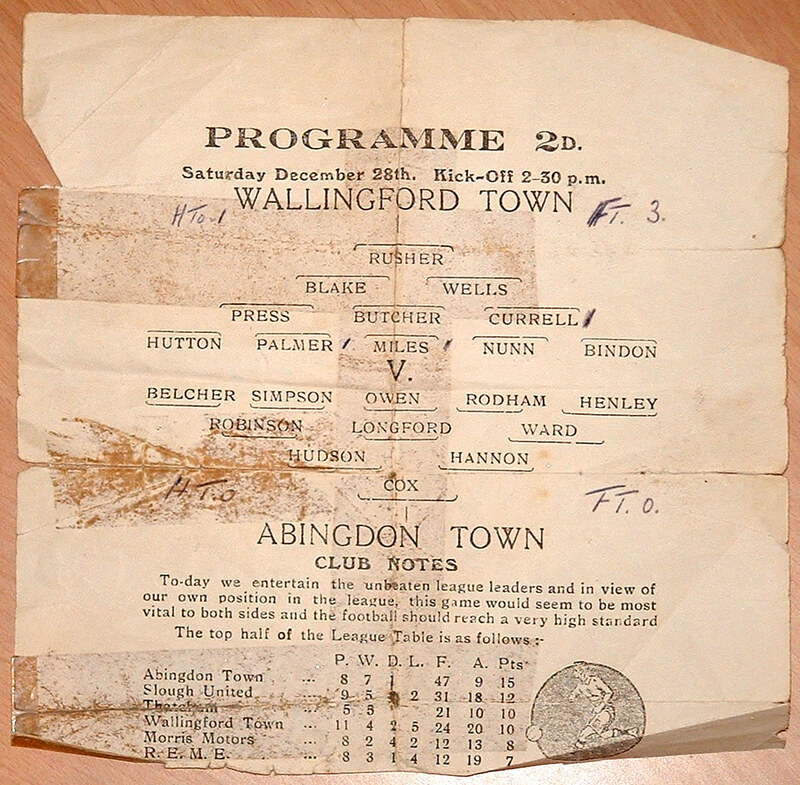 In 1995 AFC Wallingford came into existence following the merger of the two clubs then playing in the town, Wallingford Town and Wallingford United, then members of the Chiltonian League, founded in the 1930s and themselves seven time winners of the North Berks War Memorial Cup, three times in the 30s, again in 1958-59 before a hat-trick of cup wins from 1961-1963. AFC Wallingford spent its first 3 seasons in the Chiltonian League, finishing a highly creditable third the 1995-96 season, and winning the League Cup following a tension-filled final against Denham played at Henley Town. A mid table finish the following season was followed by the return of manager Larry Hill to lead the club to a convincing Chiltonian League title in 1998, during which the club won 26 matches out of 34, scoring 148 goals in the process. Carl Henry was the goalscoring sensation that season, setting a club record with no less than 62 goals scored at an average of over 2 per game. With the championship came promotion to the Combined Counties League and having set the pace early on, a top ten spot was secured in our first season. History was made in the summer of 1999 with the erection of floodlights at the club’s Hithercroft ground. During the following season the club improved its final position to 7th and had a good run in its first season back in the FA Vase. After a highly successful 8 years at the helm long serving manager Larry Hill left the club and his replacement, Dave Crowdy, successfully maintained the club’s upward rise. In 2000-2001 he led AFC to runners-up positions both in the Combined Counties League Championship and the Berks and Bucks Senior Trophy. AFC made it into the spotlight of the national media as well, being chosen as the non-league club to be followed by a journalist from The Times. Season 2001-02 saw the club go one better in both competitions, a fantastic season culminating in the Combined Counties League Championship the most major honour since the Hellenic League title 33 years previously, while Didcot Town were amongst the victims as we won the Berks and Bucks Senior Trophy, beating Milton Keynes City 3-2 in a thrilling final at Aylesbury United F.C. 2002-2003 and 2003-2004 were trophyless despite phenomenal totals of 115 and 100 league points. Striker Andy Shildrick won the Combined Counties Golden Boot award for the top goalscorer, as we were pipped to the league title firstly by Withdean and then by AFC Wimbledon. The summer of 2004 saw major upheavals at the club, with the departure of long-serving Chairman and sponsor Lindsay Townsend, manager of 4 years Dave Crowdy and the entire first team squad. 2004-2005 turned into a long and ultimately unsuccessful struggle against relegation. The club found itself in the Combined Counties First Division for the first time, but thanks to a tremendous run after Easter managed to bounce back at the first time of asking. Following the demise of Ryman Division 2 and an influx of clubs to the Combined Counties League in 2006 the club transferred back to the Hellenic Premier from which the old Wallingford Town were relegated in 1989. Off the pitch progress continued to be made with the aid of grant funding from South Oxfordshire District Council and the Football Foundation a 114-seat stand opened along with new changing room facilities in March 2006. But relegation back to Hellenic Division 1 soon followed and the financial strain of remaining at step 6 of the national football pyramid took its toll. Several seasons of high player and management turnover ensued and after the most successful decade in the clubs history a rapid decline in fortunes followed. In 2008 the club took the decision to consolidate by taking a step back to local football and returned to the North Berks Football League after a 55 year absence. The first season back at this level almost saw a further slip to the second tier of local football, relegation only being avoided on the last day of the season in a re-played fixture with Steventon, which sent them down instead. The next two seasons in the North Berks saw 5th and then 4th place finishes to steady matters on the field as well as an appearance in the North Berks Cup Final in 2010 which ended in a 1-0 defeat to Saxton Rovers but managers continued to come and go at a time when stability and continuity was needed. In 2011 AFC entered a new chapter in its existence with the formation of the clubs first ever junior sides at under 13 and 14 in a bid to produce the under 18 and senior players of the future and with the aim of generating greater local interest in the club from the local community. A new management team took over with a long term aim of stabilising the club, developing a regular playing base and moving the club forward again. A season that began with just 2 remaining regular players from the squad of the previous season meant the 2011-12 campaign was going to be difficult and relegation to the lowest level the club had played in for over half a century looked inevitable when it took until mid-October to register a win but a fine end to the season, culminating in just one defeat in the final 5 games kept us up and halted any further slide down the divisions. With the first year mission of avoiding relegation accomplished, the aim for 2012-13 was some tangible on field progress which was achieved with an appearance in the North Berks Charity Shield final of 2013, losing 1-0 to a late goal against Berinsfield. During the close season of 2013 the club reverted to its former name, to become Wallingford Town AFC, as part of its bid to become more synonymous with and representative of the town itself and switched from the red and black kits of the past 40 years back to the original 1922 club colours of red and white stripes. A great read and very well put together Duncan. I have been involved with the club since 1997 but it was fascinating to read the clubs history prior to then. Oxford Journal Saturday 27th April 1889. Great to read about the history of the club past and present. The club holds some great memories for me with regard to my playing career and some wonderful people I have met along the way . Also the people we have so sadly lost along the way r.i.p ( They will never be forgot ) It would be nice if some photos could be available from the archives ( obviously after the dust has been removed ) to acknowledge the good things a lot of people have done for the club both as players or in other roles. Please keep up the good work it would be nice to see new additions.